Return to Historical Flags Page I or on to Page III. 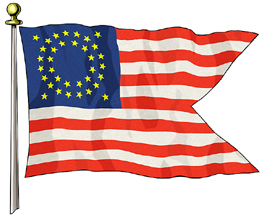 All Historical Flags are DuPont Solar Max Nylon with canvas headers and brass grommets. The U.S. Cavalry used Guidons in the Civil War as well as the Plains Indian Wars later on. The cavalry were the last of the three branches of service of the U.S. Army to get to carry the Stars & Stripes in battle - artillery was first in 1836, infantry then in 1842, and the cavalry at the start of the Civil War. This was also one of the three flags of Colonel George A. Custer and the Seventh Cavalry at the Battle of Little Big Horn, as this was the standard Cavalry Guidon of that era, 1876. Ours is 3'x5' outdoor nylon. As the Niña, Pinta and Santa Maria arrived at current day San Salvador, on October 12th, 1492, Christopher Columbus wrote in his log book that he had taken from the Santa María the Royal Flag, and the captains Flag of the Pinta and the Niña. About this last flag, we know it was a Capitana Flag; a Spanish military term for the expedition. It was used to distinguish the ships under the command of Christopher Columbus. It was not a personal/private flag belonging to him, but a sign of the fleet under his authority. Each ship had a captain with this Flag. It could have been swallowtailed, but only oral transmission remains of the flag. The symbols it contains, (the "F" for King Fernando and the "Y" for Queen Isabel, crowned, and separated by a cross) are engraved at his burial mound in the Cathedral of Seville, but no flag shape is described. Our 3'x5' durable outdoor nylon Columbus Flag will lead the way on your next expedition. The Cross of Burgundy was adopted in about 1520. It was a symbol of Phillip I, Duke of Burgundy, whose son became King Charles I of Spain in 1516. The Cross of Burgundy and variants was probably the most common banner displayed on land and sea in New Spain, particularly by the Spanish military. Today, many Puerto Ricans state that this flag is not the "Cross of Burgundy" but "La bandera de San Andres de la Infanteria." translated "The flag of St. Andrew of the Infantry." St. Andrew is the patron saint of the Spanish Armed Forces (Even to this day.) The White and Red flaming cross represents the colors of "El Tercio de Nueva España". This regiment became the 29th local infantry regiment that saw action in the British invasion of Puerto Rico in 1798, The Spanish-French war of 1809, The war of 1812 in Louisiana under the command of Bernardo de Galves and the Spanish-American War of 1898, where the regiment was disbanded after the conflict ended in favor of the U.S. The Flag is still flown at San Felipe del Morro Castle in San Juan as a tribute to this regiment. Our 3'x5' outdoor nylon Flag will fly proudly over your castle and conquered territories! The Cross of St. George Flag was in use during the Crusades. It became one of the national emblems of England as early as 1277. In 1497, the St. George Cross flag was flown by John and Sebastian Cabot on their voyages from England to New Foundland and the North American continent, as well as by other English explorers including Francis Drake, Sir Humphrey Gilbert and Sir Walter Raleigh. That Richard Lionheart was the first to take the Red Cross of St. George is unproven. Indeed, at that time the English Crusaders wore white crosses, the French red, and the Flemings green. St. Thomas of Canterbury was the English patron saint, and the first known appearance of the banner of St George was in 1300 at the siege of Caerlaverock. Our 3'x5' Cross of St. George is made of DuPont Solar Max outdoor nylon. This unique Flag has an elongated canton and blue stripes. It was raised over the Guilford Courthouse, North Carolina on March 15, 1781 under the leadership of General Greene whose militiamen halted the British advance through the Carolinas and turned them back to the seaport towns. This was one of the bloodiest battles of the long war with the British losing over a quarter of their troops. Our durable Solar Max Nylon is a 3'x5' outdoor Flag. Our 3'x5' Culpeper Flag made of Solar Max Outdoor Nylon by DuPont will stand up to all the elements. 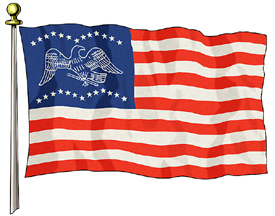 The "Moultrie" Flag was designed in 1775, and flew over Fort Moultrie (then Ft. Sullivan) in Charleston Harbour. This flag was shot away by the British in a battle in 1776. This was the flag of the South Carolina "Minute Men". This flag was carried by General John Fremont on his explorations in the far west during the 1840's. The Army did not normally carry the national flag during this period and this distinctive flag was designed and made by his wife, Jessie Benton Fremont, especially for his expeditions. The original flag is on display in the Southwest Museum in Los Angeles, California. This French flag was used from 1400 until 1590. The most important flag carried by explorers and settlers was most likely the royal flag, since this was a symbol of the authority of the king in the new lands. In the early sixteenth century the French royal flag was blue with three gold fleurs-de-lis representing directly the shield in the royal French coat of arms. Fleur-de-lis translates to "Flower of the Lily". Prior to the French Revolution, there was no national flag which represented France. From 1590-1790 this flag is one of four that was used on warships and fortresses. The simpler designs such as this were used in ordinary circumstances and it is believed that the white flag of France flew over all or most of the French forts and settlements in America. This flag and this design with the coat of arms of France in the center are most commonly associated with ceremonial occasions from 1590 - 1790. There was no specified number of fleurs-de-lis for these flags. 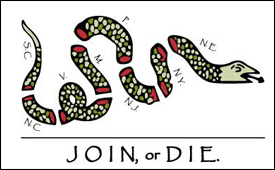 Actually this design was printed onto lengths of yardgoods and cut off to size as needed. General Lee's HQ flag has an unusual star arrangement that was believed to have been designed by his wife Mary to reflect the Biblical Arch of the Covenant. The Lord Baltimore flag combines the black and gold family arms of the lords Baltimore, the colonial proprietors of Maryland, granted to the first Lord Baltimore - George Calvert in 1622. This flag was used to represent Maryland from the 1600's until the Revolutionary War when the United States was born and a national flag was used. Through the years various banners were used to represent the state, although none was adopted officially as a state flag. The State of Maryland did not adopt an official state flag until 1904, and that flag incorporates Lord Baltimore's colors in two quadrants. This Bedford Flag is 3'x 3 2/3' made of DuPont's Solar Max Outdoor Nylon.